A century ago on this day the Representation of the People Act passed into law. In the following December, women were allowed to vote in Parliamentary Elections. BUT not all women – only those over 30 and who possessed certain property qualifications. In the same election all men over 21 had the right to vote for the first time. 8.4 m women could now vote and they comprised 43% of the electorate. Had there been equality then women might have outvoted men! The Suffragettes, led by the Pankhursts, took the view that peaceful means had achieved little in 50 years and turned to militant and violent means to get the vote. The consequence was that many were imprisoned and force fed if they went on hunger strike. What about Tewkesbury and Gloucestershire? Jennifer Slack wrote an article for THS Bulletin 15  on [Mrs] HARRIET MCILQUHAM: A TRUE PIONEER? She was the wife of a wealthy landowner in Staverton/Boddington and in 1881 became the first married women to be elected a Poor Law Guardian and in 1889 was manoeuvred out of her victory as a County Councillor. She was, therefore, a suffragist. However, in 2015, Derek Benson in Bulletin 24  WOMEN’S SUFFRAGE ACTIVITIES IN TEWKESBURY argued that, towards the end of her life in 1910, Mrs. McIlquam was supporting the suffragettes financially and voicing support. 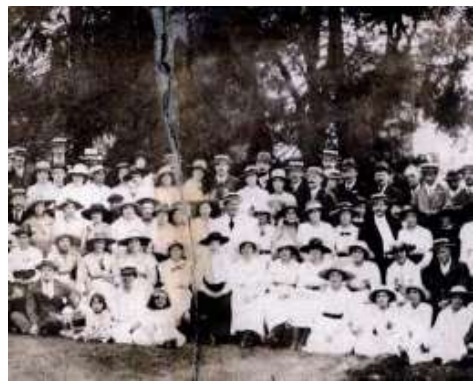 Derek put the local suffrage activities into perspective and does show that locally there was support for female suffrage from male religious leaders and politicians, especially in the late 19th Century. Although there were meetings locally, there did not seem much local fervour before 1914, though some visiting suffragists were fined in 1909 for a motoring offence while trying to arrange an open-air meeting in Tewkesbury!